By now, the description of CrossFit's three essential pillars is well-known: constantly varied functional movements executed at high intensity. 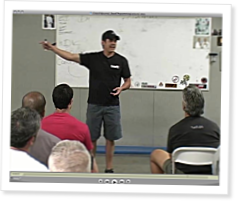 In this video from the beginning of a lecture on CrossFit programming, Dave Castro, one of CrossFit's training directors, breaks that down and goes into more depth on the proper application of the principles of variety and intensity (he'll cover the third pillar, functional movement, in a future video). Variety is about more than just changing up which exercises you do, and intensity comes with some caveats and prerequisites. Dave explains what that really means for us, in the most practical terms.